Stewart's Garage was founded by Billy Stewart on Auchamore Road in 1982. Providing routine servicing and repairs, the business grew, based on Billy's straight-forward, honest approach. 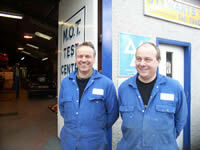 In 1988 the garage became a MOT testing station. Needing more space and wanting to expand the capacity of the business, as well as offer more services, Stewart's Garage moved to its present site on Wellington Street. In 1993 a full body shop was added with the move. In 1995, Billy's brother Alan joined the business as a partner. In the year 2000, the garage was awarded a police recovery contract, and the business invested in a specialist recovery vehicle. The garage now employs 5 full-time mechanics, one bodyshop mechanic and is training an apprentice. Stewarts Garage subscribe to the Motor Industry Code of Practice, the only motor code to be approved by the Office of Fair Trading. We are the only garage in Cowal, and one of two in Argyll to subscribe to this code. A link to our rating page is on the column to the right. Over the past few years, customers have approached the Stewart brothers asking to help source good quality used cars. Each vehicle was of course checked thoroughly and given a good warranty before each sale. Although car sales may have started as a favour to long standing customers of the garage, it has become a more substantial part of the business as the Stewart's good reputation has spread. Customers have found the cars they want, with a peace of mind built upon the reputation earned by the business over the last 32 years.